035. THE "TERRA NOVA." Issued by John Player & Sons. (1912). 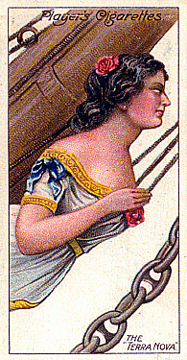 Card number 14 from a set of 25 entitled "Ships' Figureheads" Size: Ca. 1.4" x 2.68". Recto: Profile view of the Terra Nova's figurehead. At top: Player's Cigarettes. Lower right corner: The "Terra Nova."